The sequel as may be to Sunshine Sketches of a Little Town and for my money the best Leacock I've ever read. Which is saying something; he's second only to Wodehouse in my pantheon of twentieth-century humorists; but if anthologies are anything to go by he was best known for the parodic short stories of the 1920s -- which are often great, smacking down the pretensions of that literary era, and incidentally featuring much great writing in their own right -- rather than the more socially-aware work he wrote in the 1910s. Sunshine Sketches has recently been reissued with illustrations by Seth; though I've had multiple copies for years, I haven't read it yet: my understanding is that it's a collection of idyllic, sweet and nostalgic Canadian stories, completely unlike the savage satire of the delusional monstrosities wealthy Americans inflict on the world that Arcadian Adventures contains. 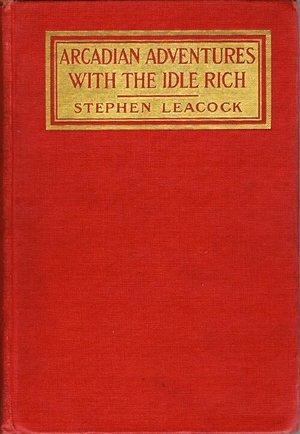 Leacock was a professor of political economy at McGill, and his close awareness of the ways that institutions self-perpetuate and the wealthy bend the operation of all things toward their own profit underline everything in this book, even the chapters that are dopier Wodehousian farce: like Twain, it starts as a sort of romp and ends in a sort of cosmic despair. Published on the eve of World War I, nothing has changed except the outer cultural forms by which the vultures of capital pretend to be human.